A very young plant of the Claret Cup. These bloom at a very small size so should come into its’ own in another season. Very cold hardy if not in prolonged freezing, a frost will not take it out. 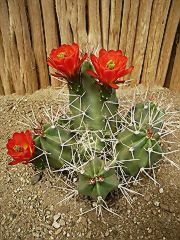 Like all of the Echinocereus the flower buds push right through the skin and will leave an annual scar as the blooming years build up. This clone shows a lot of bright green body color so becomes a spectacular specimen with age.